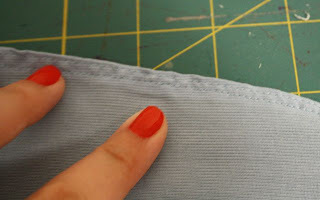 Gertie's New Blog for Better Sewing: Making a Shirred-Back Dress, Part Two: Shirring! 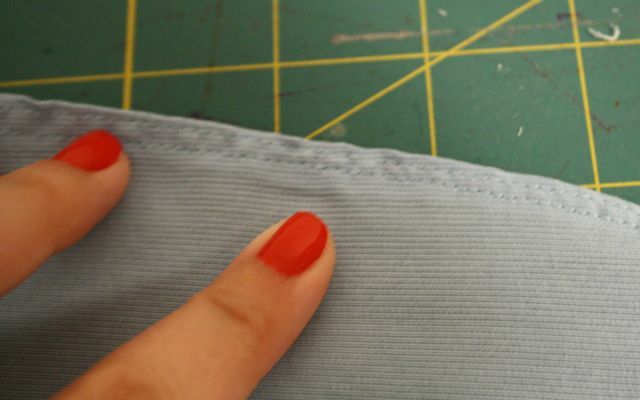 Making a Shirred-Back Dress, Part Two: Shirring! First, read part one to modify your pattern to make it wider. Now we're going to shirr! 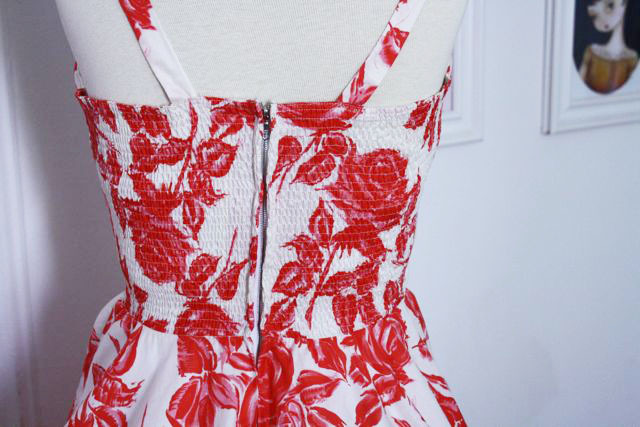 To start with, you need to press the top of your dress backs. We're going to use a method that avoids getting the ruffled top look that you see on little girls' sundresses--a bit more elegant and vintage-inspired. Press down 5/8" at the top and then fold the raw edge in to meet the fold. Hand-wind a bobbin with elastic thread. This is the brand my notions store carries. As you're winding, you'll need to stretch the thread a little so there's a bit of tension. I just give mine a little tug at the top of the "wind." I'd recommend winding a couple bobbins to start, since the elastic thread is fairly thick and not much fits on one bobbin. Load the bobbin into your machine, pull it up, and treat it as your regular bobbin thread. Stitch as normal from here on. 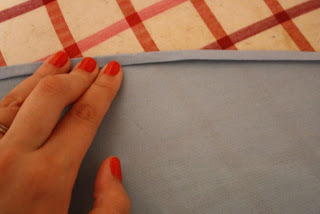 All stitching will be done from the right side of the fabric so that the elastic is in the inside of the dress. I used my usual length and tension, but I know some people lengthen their stitch and tighten their tension. Do a practice run to see what works for you. Edgestitch about 1/8" away from the top. Do another row of stitching at the bottom of the turned-under seam allowance, about another 1/8" away. It won't really get stretchy yet; it might just ripple a bit. Now you begin shirring rest of the rows. 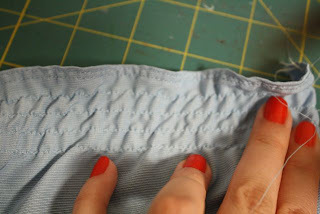 Make the next line 1/4" away from the last, and then continue in rows 1/4" apart until the end. The fabric will continue to tighten up as you go. When you're done, give the piece a steam with your iron and it will shrink up! 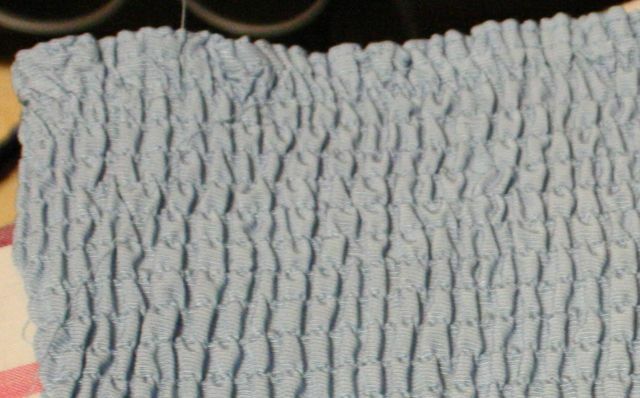 I've done this technique on a Bernina and a Janome, and both worked really well (though the Janome made shirring that was a bit tighter). Many people mentioned having trouble shirring at all on a Brother machine. If you have one, definitely check out this video that will help you adjust your bobbin tension so it will work. I made a couple videos showing the process, but the sound quality is bad enough that I decided not to post them here. (Last time I use my iPhone for this sort of thing.) You can watch them at your own risk here and here. Tomorrow I'll show you how to sew the bodice back into your dress. 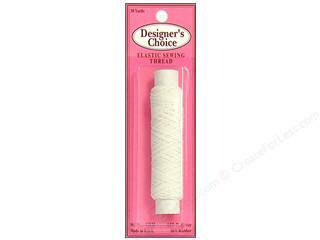 You'll be using the elastic thread again so make sure you have a little left. you make it look easy! may have to have a go, not for me but tiny girl loves new frocks! Wow! You make that look easy! I love the soft way it feels against the skin. I may actually work up the nerve to try it. What nail color are you wearing in the picture? Thanks for (another) really well explained tutorial! Solange, it's Essie Lollipop. I almost mentioned that in the post since I knew people would ask! How about shirring on a Viking? I'll bet it's a dream given that Vikings are the best machines ever (especially those that were made in Sweden...I'm not sure about the Chinese ones). Anyhow, elastic in the bobbin is great. Try free motion with the elastic...you'll get that puckery jersey you see in all those expensive Anthropologie tops. I have had "learn to shir" on my to do list for years! I've actually got a smocking machine instead now but will still give this a go sometime. Did you use your normal foot or a shirring foot? My sewing machine handbook suggests either and even the cording foot for sewing with elastic thread. Thanks. Coincidentally I just saw a dress I'd like to copy and it had this shirring. Now I get to try it out. BTW pretty dress! Gertie, I've tried shirring just the way you explain here but the thread pops when I stretch the fabric. I tried changing the tension but then the shirring is too lose and doesn't gather. Do you know what could possibly be the answer to this? Sewjourner, what kind of machine do you have? I wonder if changing the bobbin tension (like in the video I linked to) would help. I love this technique! I actually used it recently to make a top. I altered the pattern in the same way, but with a little extra width as to eliminate the need for a zipper. It came out fabulous! It is in my burdastyle studio if you want to check it out, my member name is mamadiosa. Thanks for bringing this technique to the masses! Nice tute :) I've had great luck with shirring on my Janome, it pulls up the fabric very snugly. 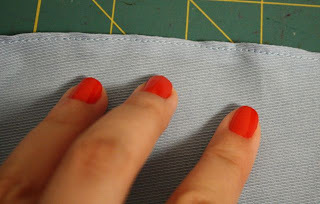 @Sewjourner, do you stretch the fabric out as you're sewing? 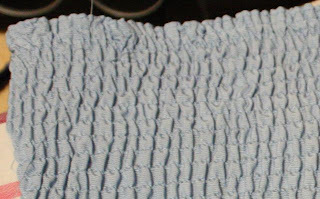 If your machine shirs tightly (as mine does---my shirred fabric looks like Gertie's "after steaming" picture without any steam at all), you will probably need to stretch it out as you go along so that your (non-elastic) stitches are the same length as the stretched fabric, not the gathered version. Or at least that's my guess ;). Thanks for the tutorial and the videos. You make it look so easy. Thanks for showing us the way to eliminate that cutesy-poo ruffle on the top edge. It's much more sophisticated looking this way. That ruffling has always put me off. Gertie and Tanit-Isis, thanks for the suggestions. I'll give them a try. I'll have to try this on my Singer... I bought a thrifted blouse with shirred sleeves this week, and I love it and would love to recreate it. So I'll see how Singer likes this technique! It looks good. 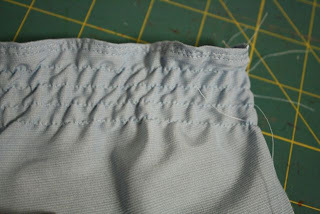 How did you start and finish each shirred row? I've had trouble with the elasticated thread pulling out at each end. Thanks for the tutorial! I was really looking forward to making a shirred back dress but no such luck. How typical that I should not only have a Brother machine but one where I can't alter the bobbin tension without dismantling the whole machine!!! I'm either going to have to find a new use for elastic thread or go steal my mum's machine! This is dress is truly beautiful. Gertie, thanks for your superb tutorial! Coincidentally, I was just about to make a sundress when you posted part one, so I've been glued to your blog waiting for the details in the subsequent parts. It's very, very helpful and I'm going to try it out on my sundress. I have a question, though: why does the shirring cinch up when you steam it? Is the elastic thread shrinking? If so, are there other circumstances that will make it shrink further (like a little time in the dryer)? 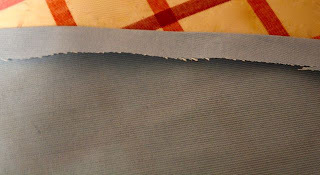 Another tip for sewjourner: make sure your elasic is new. Maybe what you have was on the shelf a while before you purchased it? I've had old elastic thread pop on me like that. 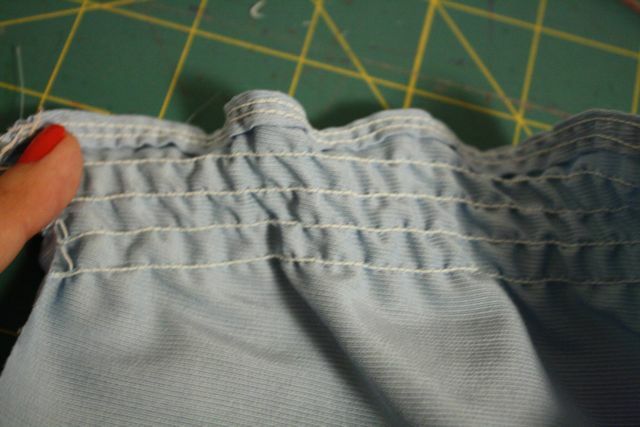 just wanted to add, you cannot do this kind of shirring on a computerized machine with drop in loading (like the new brothers) unless it has an elasticized bobbin thread setting (I think there's a Husqvarna computerized with the option) because the bobbin tension is constantly regulated and adjusted. You just end up with snapped upper thread and a tangle of elastic thread. I love my brother computerized top loader for 90% of sewing, but keep a couple old machines around (late 1990s Bernina Bernette, early 1960s Husqvarna) for stuff like elastic shirring). I tried this technique out this weekend, using my 1940s-era Singer, and it shirred up pretty tight. I think this might be due to the fact that the thingamajig that the thread goes through as it leaves the bobbin is quite tight, so the bobbin tension is pretty severe. I didn't try adjusting my bobbin tension, though, because the shirring worked just fine (though snug); only I had to be quite careful when pulling on the bobbin thread to cut it at the end of a row of shirring. Also, I should note for fellow newbies to this technique: it was very hard for me to keep my rows of shirring even on the first try. I shirred a piece of fabric about ten inches square with rows spaced a theoretical 1/4 inch apart before I really got the hang of keeping the rows straight and even. Patience and practice pay off! A very good tuto here ! But i've always been told by Singer, Brother and other sewing machine seller that this technique can break the machine, because of the tension. Some machine seller say that if you really want to put elastic shirring you have to get an other "tank" that contains the bobbin, that would be specially used for shirring, so that the tension in your machine for "normal" sewing is not totaly broken.